The rhetoric is impressive, but the government’s policies look unsustainable. Acknowledging that the energy sector plays a critical role in his country’s development, Indian Prime Minister Narendra Modi recently commented: “We want to increase speed and at the same time, scale new heights of development and one of the sectors is energy.” Coal has been a key source for the nation’s expanding energy requirements. The new policy on renewable energy and objective of generating 175GW of electricity generation by 2022 (from solar, wind and other forms of renewable energy) by 2022, is a bold step. Focusing on clean energy and energy efficiency, Modi called for a global shift from a “carbon credit” to a “green credit” for clean production, and described it as an immediate need. India’s renewable energy generation capacity in 2014 was 31.7GW. To meet its objectives, government has proposed to add additional capacity of 4.46GW by 2015-2016. As of March 2015, only 44 percent of the target has been achieved. The 2015 budget allocated $400 million for grid connections and distribution networks for renewable energy projects. In addition, the government has doubled the tax on every metric ton of coal brought in or produced within the nation. Cumulatively, these steps are expected to enable additional generation of renewable energy. Leaving aside the lofty rhetoric, let us assess India’s internal energy dynamics. Any objective review of the performance of the central and state electricity boards would indicate the serious constraints the country is facing to connect nearly one third of the population to electricity grids and ensure that the other two thirds that are connected receive a reliable and continuous supply. India is the third largest producer of electricity in the world. It has 258 GW installed generating capacity. In spite of this, per capita electricity consumption was only 684 kWh in 2011. The country has been in power deficit for decades. A major reason is insufficient transmission capacity, compared to generation capacities and load requirements. In 2012-13, the country’s domestic power exchanges failed to consume 100 percent of power generated due to transmission bottlenecks and serious mismanagement. This amounted to a loss of around $212 million. The government estimates that 24 percent of generated electricity is lost each year during transmission and distribution. One in three Indians still rely on sources like kerosene, diesel or biomass, all of which contribute to indoor and outdoor pollution. A recent OECD study found a 12 percent rise in the mortality rate in India attributable to air pollution and estimated that the cost to society was $500 billion. In India, indoor air pollution ranks second and outdoor pollution fifth among major silent killers, according to the Global Burden of Disease report. 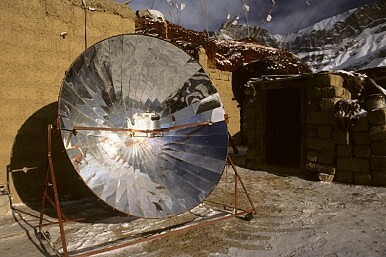 At first sight, prospects for renewable energy may appear quite promising. It can be generated and distributed locally. The government claims that harnessing 100GW of solar energy will generate nearly a million new jobs, a definite benefit for a country that needs to create 13 million new jobs each year. There are still significant gaps in the costs of electricity sales from various sources. The cost of electricity produced from solar photovoltaic cells has come down from INR 20 ($0.31) per unit to prices ranging between INR 6.50-8.00 in various states, but only after substantial subsidies from government. This is more expensive than conventional energy (around INR 5.7 per unit), and making coal is still the most economic energy source. The cause is the higher capital costs of installing and maintaining renewable energy infrastructure. The effects of increased taxes on coal (in the 2015 budget) may narrow the difference. Still, promoting solar energy will require huge subsidies, which will be in addition to numerous other subsidies that are already being handed out to energy and other sectors. The question that must be asked is whether the Indian government will sustain these subsidies over a period of years? Can these subsidies, once entrenched, be withdrawn due to political reasons? Also, are subsidies the best allocation of a nation’s limited financial resources? Transmission shortages or higher capital costs are not the sole problems of public electricity boards. Unsustainable subsidies and low tariff rates act as serious impediments to financial and functional stability. In 2013-14, the average cost of electricity supply was INR 5.93/kwh, but the average tariff was INR 4.80/kwh. The annual financial statements of state electricity boards show that the amount of unrecovered subsidies from agricultural and domestic sectors was an astronomical $8.2 billlion in 2013-14. No country can afford such unsustainable policies indefinitely. Without immediate policy measures, this gap will continue to grow, especially when costs are bound to increase while efficiency improvements remain only marginal. Irrational pricing and subsidies have led to systemic losses to electricity generation and distribution companies. This has become a serious financial burden leading to poor operation, substandard maintenance practices, bad services, and limited scope for expansion. To keep the utilities functioning, the government has been forced to consistently increase subsidies, using money that could have been better allocated to other developmental activities for a better social return. Sadly, the promise of free service is the easiest bait to attract vote banks. Take the election result in Delhi, where AAP basically won by promising highly subsidized electricity and water. Ultimately these subsidies have to be paid by taxpayers and ratepayers. There is no free lunch. In the end taxpayers have to foot the bill for inefficient electricity generation and distribution. Low rates encourage people to use more electricity, which requires more subsidies. To break this vicious cycle, users must pay for the services they receive, with only targeted subsidies for the poor. Politically this will be harder to achieve in an Indian context, where giveaways have an appeal for the majority, who may not realize that they are paying in other ways. But absent reforms, the country’s socioeconomic progress will suffer. Maitreyee Mukherjee is a Research Assistant and Asit K. Biswas is Distinguished Visiting Professor at the Lee Kuan Yew School of Public Policy, National University of Singapore.